Schmidlapp’s extensive use of light and sequencing image evolved from an early interest in the filmmaking process. As a teenager in the late 60’s, he made reg 8/ super8 films. 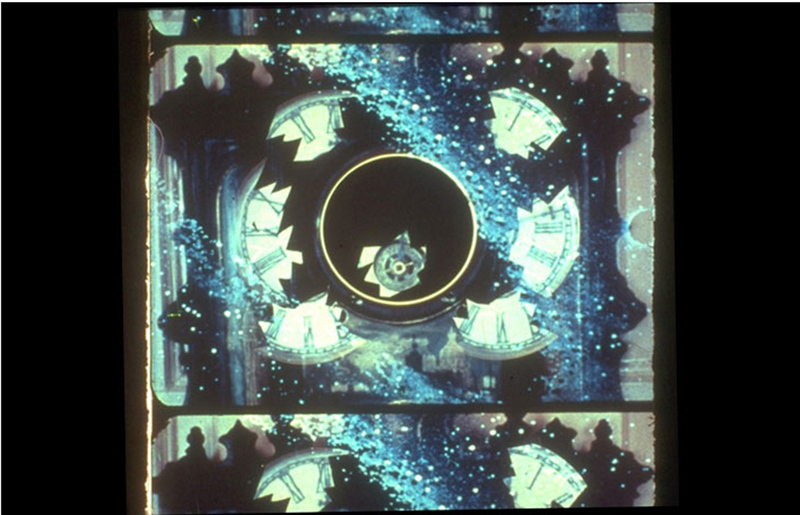 POST-8MM Hippies, 16mm optically printed film from his early works, is a work in progress. Part of it was the visual element in a collaboration, named Reality of Corn with composer Yoni Niv, which was performed by the Duo Due East 4/20/08 in New York City. 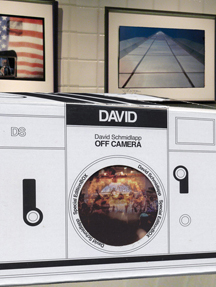 In 1999 David Schmidlapp made an award winning experimental film, Big Time Operator. 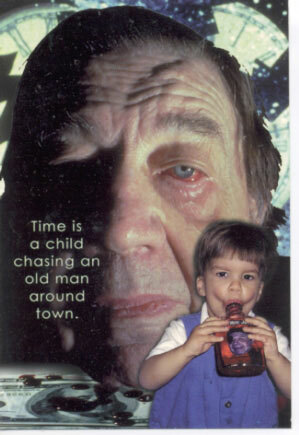 A film of chemistry and time; a disjunctive narrative of aging and corruption. Starring his actor – father, F.L. Schmidlapp who was recovering from a brain injury. (Black Maria Jury’s Citation, Big Muddy Festival Best Narrative, Williamsburg Film Festival’s Audience Best Experimental.) 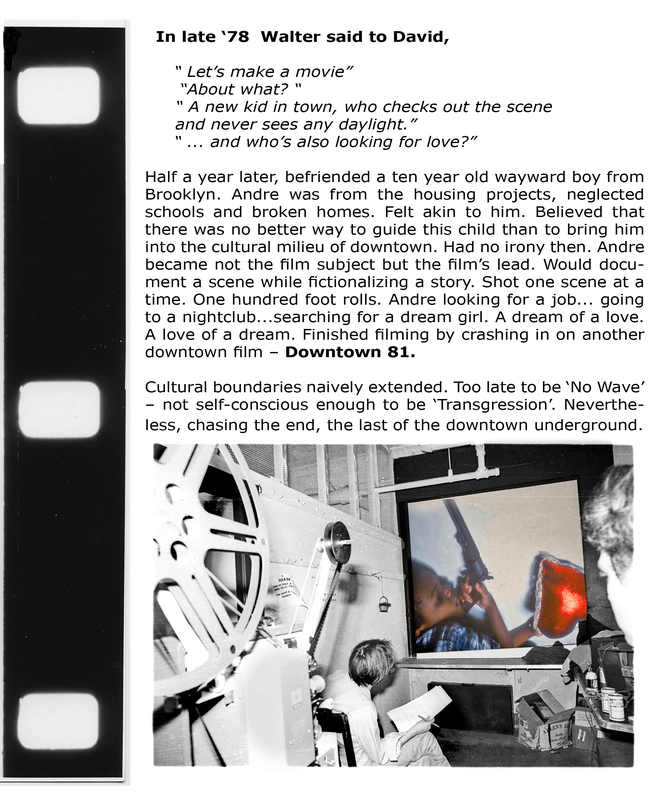 The film was screened at Slam Dance Festival and broadcast twice on Reel New York, channel13 WNET. Currently, David is collaborating with writer Stewart Meyer on a screenplay on his famed 1984 novel, Lotus Crew after finishing a script of his recent novel, Heistbroker. The metal lattice of the steel cables flicker in front of the Twin Towers. It is movement over a bridge. It’s snowing. One good thing you did before you croaked, Frankie was get me the job. Look at those Towers. One hundred-and-ten stories straight up. Anchored six stories down into the bedrock. NICKY CESSARIO (mid 40’s), well built, is driving his 1970’s Caddy in the direction of Lower Manhattan across the Brooklyn Bridge. He is dressed in WTC workman’s clothes with a name patch above the right breast pocket and is wearing tinted glasses and two rings. One is a simple wedding band and the other, a gaudy gold skull ring. He rolls his Caddy off the bridge in the direction of the World Trade Center. The job gets a little dull, but those Towers man, are like the pyramids in Egypt.